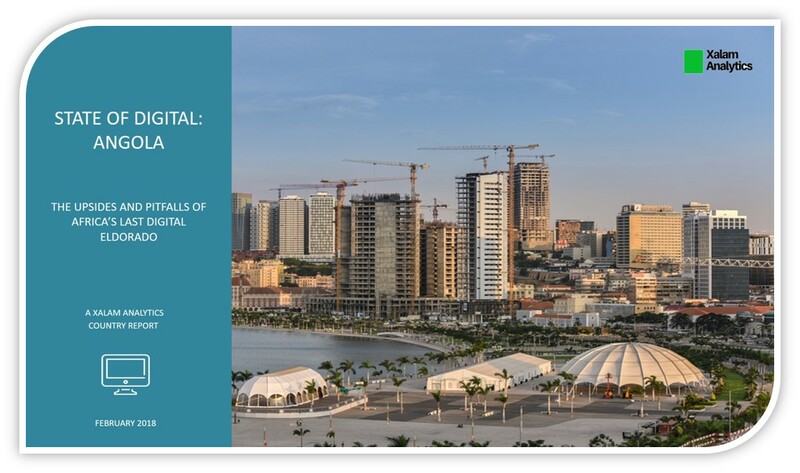 Part of this analysis has been culled from a Xalam Analytics report: “State of Digital: Angola - The upsides and pitfalls of Africa’s last digital Eldorado” – See full details here. Last November, the Government of Angola (GoA) announced a series of measures designed to attract more private investment and increase competition in the country’s ICT sector. Specifically, the GoA aims to sell a fourth “unified” licence, allowing to offer mobile, fixed broadband and video services. The government would retain a 55% stake in this new venture. In addition, the GoA plans to sell a 45% stake in state-owned carrier Angola Telecom, while also remaining the company’s controlling shareholder. The moves are part of a far-reaching set of programs outlined by new President Joao Lourenco, as part of a plan to revive and diversify an economy that has long been dependent on oil and other extractive industries (~96% of the country’s exports; around half of GDP until 2013). The Angolan economy has been struggling. The country has been in a state of quasi-recession since 2013, due to the sharp slide in oil prices – (~96% of the country’s exports). Inflation has been high, reaching ~30% on an annual basis in 2017, and nearly 100% on a cumulative basis over the past three years. The Angolan currency, the kwanza, was devalued in January 2018 and has lost ~60% of its value against the dollar since 2015. All this has provided an impetus for action in a country whose economy had heretofore been hermetically closed to outside investors. The new measures are therefore welcome – especially in the ICT sector. Nonetheless, we do not believe they go far enough to turn Angola into a compelling investor opportunity. On paper, the proposed Angolan assets have real upside. Angola is the third largest economy in sub-Saharan Africa (SSA), after South Africa and Nigeria. Its telecoms sector is a paradox. With an annual revenue around $1.8bn (using February 2018 FX), this is the fourth largest telecoms market in SSA. Only South Africa, Nigeria and Kenya are larger – an astonishing feat for a market with only 11m mobile subscriptions. Its enterprise/B2B ICT market has some depth; it is the third largest in SSA (on par with Kenya’s), largely due to high prices, a relatively dynamic financial services sector, and an active ecosystem of foreign companies in the mining and oil and gas sectors. Through wholesale carrier Angola Cables, Angola is building a credible West African hub for global Internet traffic, and a potentially solid alternative route for African and Asian Internet traffic to the Americas. The deeper picture is not as pretty. 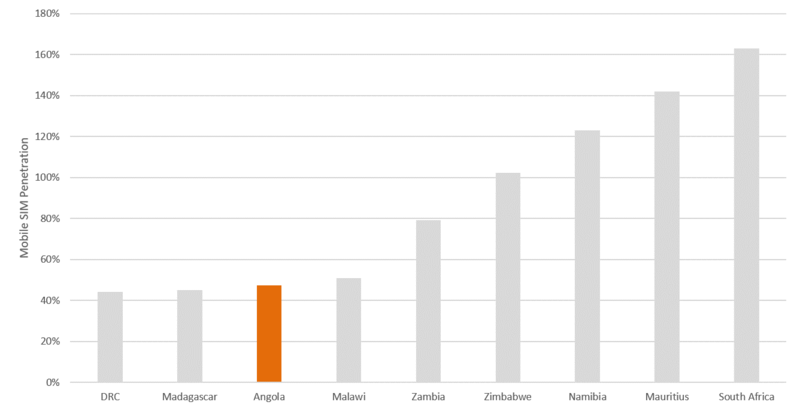 For all its revenue size, Angola has one of the lowest mobile services penetration rates in the 15-country SADC economic grouping, barely above the DRC’s. Mobile operators’ upper-end price structures mean that around half of the Angolan population is essentially priced out of the mobile market. Mobile prices are so high that the Angolan government has felt the need to undertake an extensive program to install public phone booths, at a time those have essentially disappeared from the African telecoms landscape. This gap between performance and potential creates a substantial opportunity for any new entrants. We are projecting Angola’s mobile SIM base to at least double within three years of the launch of a competitive offering – subject to a variety of assumptions. But the obstacles are significant, from high capital requirements for network rollout (Angola has the fifth largest land area in SSA), to a challenging economic context. The biggest threat to any new entrant, however, lies with a combination of weak regulation, deeply-entrenched interests and a singularly dominant player (Unitel, Angola’s largest operator, and on a per subscriber basis, Africa’s most profitable operator). This is scary mix that in our view, should make even the hardiest of investors think twice. Source: Xalam Africa Market Dashboards; Angola revenue and ARPU estimates use February 2018 FX. Where does Angola rank in Sub-Saharan Africa? 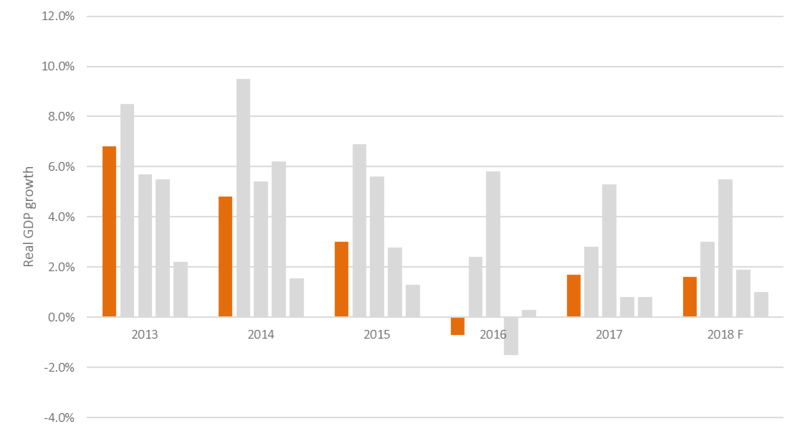 See an interactive version of this chart, for Angola and 10 other African markets, based on 12 economic and ICT market indicators. The Angola Telecom (AT) privatization opportunity is more complicated – but should similarly be object of investor caution. Angola Telecom is a troubled business, one of several state-owned companies Angola’s new president has referred to as “dead weights for the state”. The company was bailed out by the government in 2012 and its recent performance has been subpar, beset by organizational instability and tough competition in key segments. AT has essentially been squeezed out of the voice and fixed broadband businesses as traffic moved to mobile networks. Today, its value lies less with what it does, and more with what it owns; a disparate mix of assets, from the largely useless (a small minority stake in mobile operator Movicel) to the potentially compelling – dominant stakes in TVCabo and Angola Cables. The structure mooted for the privatization of Angola Telecom is still somewhat undefined; the GoA will remain the majority shareholder, while a stake is floated on the Luanda Bodiva stock exchange, and/or sold to an international partner. This seems to suggest that the GoA is looking for passive private capital; but what AT needs is not another round of “international consultant-come-fix-and-go”; it needs a fully invested partner with deep operational expertise, and the freedom to make the hard calls to revamp a flagging and incoherent business. Anything short of that would merely be akin to privatizing the company’s losses. There are other concerns, including a bewildering, opaque cartel-like setup, where key ICT players hold stakes in each other, and are deeply invested in each other’s success and failure, making it extremely difficult for outsiders. The GoA will have to take stronger steps to demonstrate that it is inclined to fix this too. In the end, the Angolan telecoms opportunities are structured as if they were can’t miss opportunities. They are not. The government appears to be banking that investors will essentially ignore the above shortcomings and dive in. Ten years ago, perhaps. Today, we’re unconvinced of that – though in fairness, it only takes one daring bidder to drive up prices. Where does Angola rank in Sub-Saharan Africa? 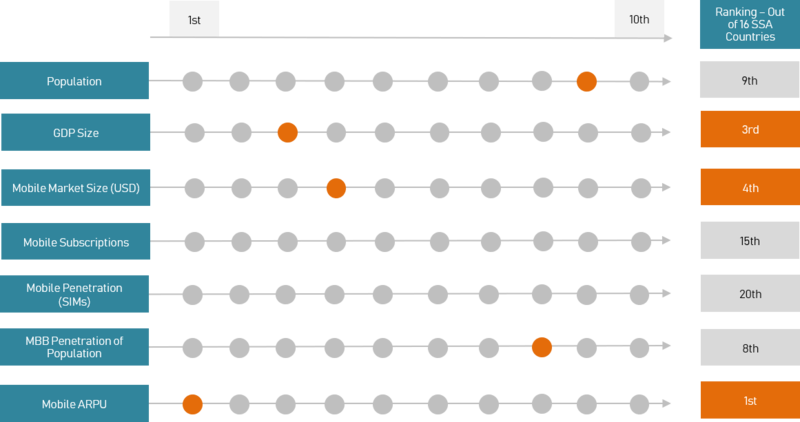 See an interactive version of a sample ranking table, covering 13 African countries.